The composition of a technology plan is a complex process composed of many parts. The integration of curriculum instruction, levels of technology across the curriculum, the establishment of technology standards, and strategies for the development of equity along with administration and support staff are just a few of the components that assist in the creation of a successful technology plan. A technology plan encompasses other plans, which provides the necessary support for the technology plan’s development. For example, there are professional development plans and technology support plans that have completely different goals. 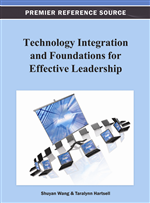 This chapter focuses on components, strategies, and information that comprise the foundation of a technology plan. The technology plan is a basic tool that can be modified to suit the situation, and used to outline and identify the basic needs for the development of a technology plan. One of the first areas to consider is how to integrate technology for curriculum and instructional purposes into the technology plan. According to Overbay, Mollette, and Vasu (2011), there are five ways that technology can be successfully incorporated for curriculum and instructional purposes. The ways presented by Overbay et al. (2011) are not centered on the technology or focused solely on the institution. The ways presented are designed around the purpose for technology and the people using the technology. Therefore, the technology leader can use the five ways to focus on integrating technology into a curriculum in a meaningful way. The first way to view integration is to remember that the sole purpose of integrating technology is not just for the sake of having technology. The individuals who will be using the technology and the reason why this technology will be used is the focus of the integration of technology. The second item to consider is that the technology plan needs to fit the institution. The technology plan should be developed with the idea that the technology integrated fits the needs of the institution; therefore, the expectation of how integration will work into the curriculum is important. Subsequently, the third item to consider is how to incorporate professional development. While having the appropriate technology is important, the ability of the staff to utilize the provided technology effectively is equally important; hence, the technology will be integrated more effectively for the benefit of the educator and the student. Overbay et al. (2011) describe the fourth way as respecting the process of collaboration. Staff collaboration is one way that allows educators and support staff to discuss needs and issues. Collaboration is an important aspect to consider in making sure the technology fits the needs and goals of the institution. The final method that Overbay et al. (2011) mention is for the institution itself to become resistant to the process of staff turnover. Becoming impervious to staff turnover is important to ensure that the processes that work in the technology plan will continue to work even when staff member chooses to leave. By providing continued support to all staff members, the goals of the technology plan can be preserved even when staff members leave and are replaced by new staff members. These five areas provide specific focal points to make sure the integration of technology in the curriculum is successful.